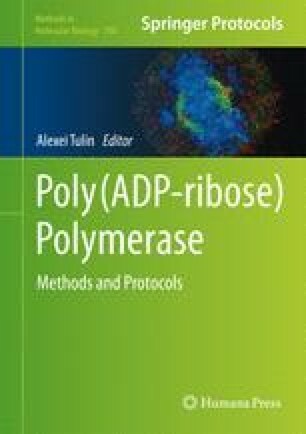 Poly(ADP-ribose) polymerase1 (PARP1) is a global regulator of different cellular mechanisms, ranging from DNA damage repair to control of gene expression. Since PARP1 protein and pADPr have been shown to persist in chromatin through cell cycle, they may both act as epigenetic markers. However, it is not known how many loci are occupied by PARP1 protein during mitosis genome-wide. To reveal the genome-wide PARP1 binding sites, we used the ChIP-seq approach, an emerging technique to study genome-wide PARP1 protein interaction with chromatin. Here, we describe how to perform ChIP-seq in the context of PARP1 binding sites identification in chromatin, using human embryonic kidney cell lines. We thank D. Martin and K. Pechenkina for comments on the manuscript. We also thank Greg Donahue (University of Pennsylvania Medical School) and Yan Zhou (Fox Chase Cancer Center) for advice on ChIP-seq data analysis. The research was supported by grants from the National Institutes of Health (R01 DK082623) to A.V.T.